The great Land of Lenfald is abundant with many useful and valued natural resources, including fish, furs, and lumber. Because of this, merchants from all over the world travel to the trading outposts of Lenfald in order to trade and barter goods. One of the more famed Lenfel trading posts lies along Hickory Creek, a small flow of water that eventually empties into Lyrebird River. The Hickory Creek Trading Post is known especially for its high quality furs. Many a Garhim has traveled down to this post to purchase furs for the long and bitter Garheim winters. Well, this is my entry to the Trade and Tolls category of CCCX. I've been working on this one on and off for a while now. The waterfall as particularly troublesome. Anyways, enjoy and thanks for viewing! Fun fact: There are 9 animals visible in this photo! Wow, now that is epic. Outstanding job! I saw this awhile ago when it came out on flickr, but I just had to comment again. 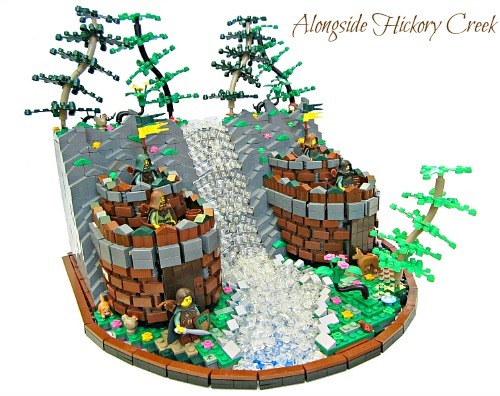 Great work on the landscape and the waterfall!